To understand why I'm running America, one First has to understand why I run. Here are ALL the reasons. I run because it feels good to run. Like everyone else on this Earth, I am a hedonist. I seek pleasure. And running provides that pleasure, in droves. Running provides pleasure in an unexpected — and, quite frankly, ironic — way. It is mainly through the pain of running that I derive pleasure. Specifically, it is the pain of the hard / long / fast / [insert other synonym for “challenging”] run that causes my body to react in a way that ultimately leads my brain to experience pleasure. This is the “runner’s high,” and, damn, does it feel good! But the runner’s high is not the only way running feels good. On some very rare occasions — perhaps once in every 100 runs — I feel something far more intense than a mere runner’s high: I experience what Mihaly Csikszenmihalyi calls “flow.” Flow is a sense of ecstasy — “of being outside everyday reality” — that provides one an inner clarity that is intrinsically motivating to the self. Running, I’ve discovered, is just about the only activity that enables me to reach a flow state. I’ve also discovered that, almost every time I’ve reached flow, I’ve been running on trails, out in the wilderness, with nothing to think about but how to run more freely than ever before. It is during these runs that I have reached a state of mind, and of being, that I simply don’t want to lose. So I run — and I keep running — until I reach that flow state once more. Searching for flow in Baltimore. Running requires tolerating — or even desiring — pain to succeed. To become a better, faster runner, I have to be willing to push my body to its physiological limit — and then past it. By pushing beyond the limits of what I was previously able to do, I am literally tearing down my muscle tissues, and prompting a tissue-repairing process. I grow stronger as a result. Of course, pain is a byproduct of this process. That pain may be small (think nagging muscle ache) or large (think of that sprint at the end of a race), but it is pain nonetheless. And, as a runner, I learn to deal with it. It goes without saying that being able to deal with pain is an incredibly important skill. Life provides a constant stream of struggles, some of which can be very painful. As a runner, I can accept pain for what it is, push through it, and bounce back an even stronger person. In fact, running teaches me to search for, and not be afraid, of that struggle. And that makes me better. Running also helps me push psychological limits. These days, it is too easy to become a drone, someone who passively sits and lets life pass him by, instead of making life happen. Running, especially out in the wild, adds that hint of uncertainty and unpredictability that lurches me out of the rut of passivity. It keeps me — literally and figuratively — on my toes. The JFK 50 Mile — my first ultramarathon, and one of the hardest races of my life. Running is a way to explore the world. Another reason I run is because it helps me see the world. There are two senses in which running does this. The first is literal. Simply put, running helps me explore the communities I live in, and the places I travel to. Part of the benefit of this is the efficiency gain; in the same amount of time, I can traverse greater distances by running than I can by walking. And that means I sometimes end up in places I wouldn’t have reached by other modes of transportation. When it comes to traveling, I have endless opportunities to “run-explore” (note: I just made that word up) — to take to the streets, needle through back alleys, and bump into the hidden treasures that await in every city. Indeed, run-exploring is the first thing I do when I’m traveling somewhere new. There’s simply no better way to acquaint yourself with a new place than to run it. The second is metaphysical. Running sharpens my senses, and makes me more aware of the natural world in which I live. I first notice myself: the pitter-patter of my footsteps, the rhythmic double-beating of my heart, the metronomic rushing of air in and out of my lungs. But then I notice the world around me: the chirping of the birds, the angle of the shadows cast by the sun, the bumpiness of the rocks beneath my feet, the breeze blowing through my hair. Most importantly, I begin to notice things I’d not noticed before — I see in an old thing something new. This awareness grounds me. Run-exploring Warsaw’s Castle Square in the summer of 2013. Even though I often run with others, the reality is that most of my running is done alone (à la “The Loneliness of the Long-Distance Runner”). But I don’t resent that. In this day and age, being alone with one’s thoughts has become next to impossible. We simply have no time to think. For me, solo running is thinking time. The beauty of the long, solo run is that I have very little opportunity to be distracted by modernity. Indeed, because I’m literally running away from my computer and my phone, I have no opportunity for such distraction. (Full disclosure: I might carry an iPod Shuffle and GPS watch, but I swear — that’s it!) As a result, I have the space to think, on my own, about whatever deserves thinking time. I spend a lot of this time thinking about the mundane: what groceries I need to pick up, when I’m going to do my laundry, etc. This type of thinking certainly isn’t life-changing, but, without it, my life would be more chaotic. But just as often, I spend my running-rooted solitude doing “bigger picture” thinking: I mull the hard questions (what do I want to do with my life? ), brainstorm crazy ideas (how about running across America? ), and let my mind wander. In other words, when my body runs wild, my brain does too. Unsurprisingly, many of our most accomplished writers, inventors, and scholars took long walks. Walking, to me, is just running very slowly. They are both ways to have the solitude that is essential to good thinking. By myself at sunrise atop Old Rag Mountain in Shenandoah National Park. Running drives me to become better, not only as a runner but also as a person. I’ve always wondered why running is so good at inspiring excellence, but I think I’ve found the answer: running limits my ability to make excuses. Excuses abound in life. We use them to explain things like missed deadlines, shoddy thinking, and sloppy behavior. Of course, not all excuses are bad or even illegitimate. But more often than not, they are. The prime danger of the excuse is the attribute that unites all excuses: they justify our failure to be, or do, our best. Instead of being accountable for all of our thoughts and actions, we let excuses bear that burden. They are our scapegoats. And when we have scapegoats, we have less reason to excel. Running reduces my supply of excuses. It does this by virtue of its objectivity; almost every aspect of running can be — and is — quantified. As a runner, I speak in terms of distance run, minutes-per-mile, time-on-feet, elevation gained, calories burned. These numbers are brutally honest. I either did run that mile in under 5 minutes, or I did not. I either did run 30 miles this week, or I did not. There’s not much to interpret — the numbers speak for themselves. The transparency of running, in turn, motivates me to do better. With each mile run, workout conquered, and mountaintop reached, I know I’m making progress — indeed, I come away feeling stronger and more capable of doing anything. Added to this is the mental boost that I gain from knowing that I can use nothing but the legs and feet I’ve been endowed with to move my body from point A to point B, no matter how far apart those two points are. It’s this sense of possibility and progress inherent in running that drives me to excellence. In other words, because I know the effort I put into running directly translates into improved performance, I’m more likely to keep at it. And the more I’ve kept at running, the more I’ve learned from it. Through running, I’ve learned that: rewards don’t materialize instantly, or without putting in effort; waking up at the crack of dawn in the dead of winter is something that night owls who dislike the cold can do; the little things — the details — really do matter; and life is so much better when you #justshowup. Indeed, I don’t think it’s a coincidence that, in everyday conversations, we often compare life to running. In so many ways, running mirrors life. As runners and as livers, we encounter obstacles along the way (oftentimes in unexpected moments) and do our best to overcome them. We focus on starting under control, not sagging in the middle, and, most of all, finishing strong. We say “it’s a marathon, not a sprint.” By running, we live. It comes down to connection, and being engaged in life. That’s really it. It’s a structure for having this purpose and focus and commitment to something on a daily basis. Everyone has his or her “thing” — that pursuit or passion that one just wants to be really damn good at, no matter how challenging it may be. Running is my “thing.” It is, in short, my gateway to excellence. 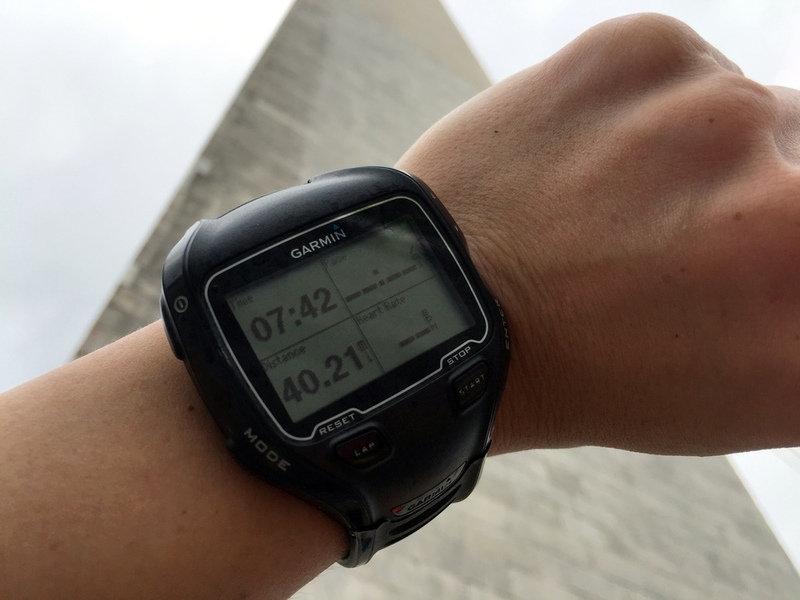 Numbers at the end of the inaugural Monument-to-Monument Run — 40 miles from Baltimore to D.C. Despite the ways in which it empowers, running — and ultra running in particular — is also deeply humbling. Running long and far has forced me to grapple with the magnitude of Nature. As a result, I’ve realized that I am — and we are — just specks. Whatever is fitted in any sort to excite the ideas of pain and danger, that is to say, whatever is in any sort terrible, or . . . operates in a manner analogous to terror, is a source of the sublime. The sublime is the environment that I often find myself in as an ultrarunner. Being in the mountains looking over the cliff’s edge, getting soaked in a flash flood, nearly stepping on a snake that slithers through my path— these are all terrifying reminders that I am a mere mortal, that Nature is far more powerful than I am. This makes running a deeply humbling experience. In short, despite the ways in which it allows me to take control of my destiny, running also teaches me how to give up control, and to be at peace with that idea. Taking in the vastness of Nature at Ahern Pass in Glacier National Park.